“Smoking” is one of those rare Dutch words that seem to originate from the English language but don’t… 🙂 The Dutch “smoking” has nothing to do with the English verb “smoking / to smoke”, which is “roken” in Dutch. – “Strikje”: bow tie. Lit. : “little bow”. – “Rokkostuum”: white tie. Lit. “skirt costume”. – “Jacquet”: morning coat, tails. Although no one in the U.S. wears or refers to a “smoking jacket” anymore. Interesting, the same wikipedia article mentions that “smoking” is used for dinner jacket in other languages as well. Leuke blog overigens. Vind je het goed als ik af en toe iets overneem? I consider the writing of “do not” or “does not” (in this example) a general grammatical issue, that one also encounters for example in the Dutch language. Here, we mean to say that “smoking” is a word that belongs to the set of “words that seem to originate from the English language, but do not”. Which might be an incorrect statement to begin with, after Brett’s comment. I’m not sure if the rule in English is as you state or that there is room for interpretation. Any native-English speaker would like to comment? I have to say that drasties.com is right. It’s a common mistake made by native English speakers as well since there is a plural noun in between the real subject and the verb. I’m slightly intrigued by the issue raised above. After reading the sentence again, I believe that the discussion whether or not “one of the” is singular or plural is usually held with respect to – in this case – “seem”. “Smoking” is one of those few words in Polish that do (not DOES 🙂 have their origins in English. I don’t think we have our own word for this piece of garment. When I post something on wwww.drasties.com from this blog I will link and refer to it. Would you be interested in posting directly on my blog? I have quite a few of American (mainly) readers. Maybe we can do something together. No way man, you’re wrong three times. First: Smoking in the meaning used here is not an English word. Second: It still should be does, because it referres to one, or in Polish: jeden. Third: Origins should be singular to: origin. An interesting question is how “smoking” got the meaning of “dinner jacket” in Dutch and other languages, such as Polish, French and German. Any views on this are appreciated! Regarding the grammatical issue that we have tried to discuss above, if anybody knows of any authoritive sources on the topic; that would be a useful contribution. The DWOTD likes to consult http://www.taaladvies.net but it obviously deals with Dutch. The question whether or not the finite verb to “one of the … that” is conjugated for a plurar or singular subject is dealt with in post http://taaladvies.net/taal/advies/vraag/1212 . They claim that in most cases the finite verb is regarded plural, but it can be singular depending on what you are trying to say. @Henk: The key part of my original sentence is “…one of those few WORDS in Polish that DO…”. Please note that the word “DO” refers to the WORDS, and not to “one”, hence it is a plural form. @Sander: According to the Wikipedia article you were pointing at, the British had these custom “smoking jackets” used by gentlemen (and gentlemen only I bet) for smoking cigars in the 19th entury. 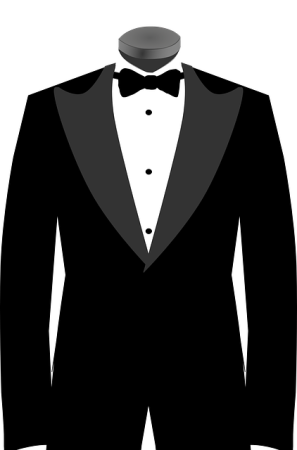 The shape has remained but the function has changed, therefore it is now called a dinner jacket in English while the 19th century name has survived in other languages. I think that the sentence “‘Smoking’ is one of those rare Dutch words that seem to originate from the English language but don’t.” is confusing for a couple of reasons. First, the word “Smoking” behaves as a gerund, a word that is usually a verb but used as a noun. In this case, it is the singular subject of the sentence. Then, there are multiple prepositional phrases (“of those rare Dutch words” and “from the English language”), the first of which contains a plural subject. It is not uncommon for even native English speakers to make verbs outside of these phrases try to agree with the phrase subject. The sentence “‘Smoking’ is one of those few words in Polish that do have their origins in English.” can be reviewed in a similar fashion. First, we must recognize that ‘Smoking’ is the subject (again, as a gerund). Then, we remove the prepositional phrases (“of those few words,” “in Polish,” and “in English”): ‘Smoking’ is one that do have their origins. In the scheme of things, though, while these sentences might make stuffy old grammar professors cringe, the message is conveyed to the reader, and that is what is most important. These are not simple sentences to begin with, and English has arcane and counter-intuitive rules to keep in mind. I make this kind of mistake all the time, and English is my native language (I’m embarrasingly uni-lingual! ).